VOIX DU REVE set the tone for what would be a disappointing race for Willie Mullins when nearly parting with Ruby Walsh at the first as Lostintranslation took up the running from the off. Vinndication made a mistake at the fourth while Mullins' Real Steel also blundered at the seventh as Robbie Power continued to set a good pace up front and had many of the ten runners out of their comfort zone. 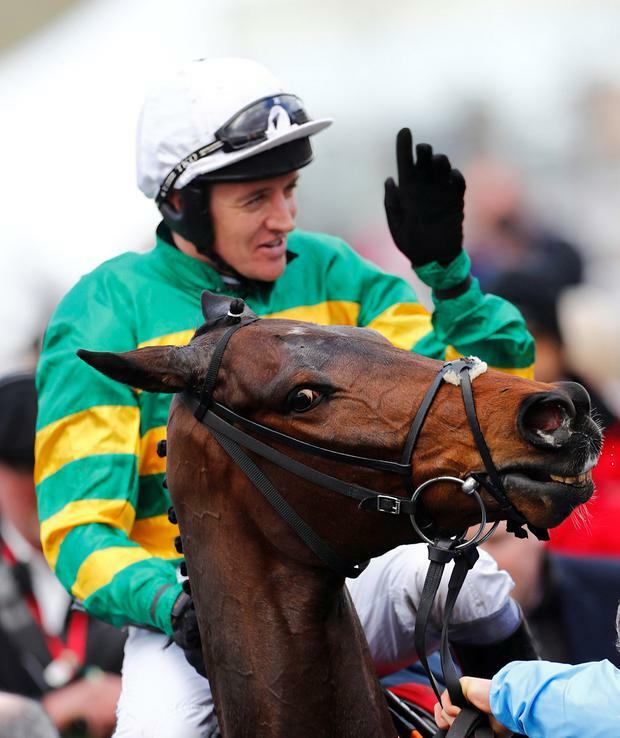 Gordon Elliott's Mengli Khan - which improved greatly on recent showings to come home a creditable third - was always close by, while favourite Defi Du Seuil was handy under Barry Geraghty. Geraghty shook him up between the last two and he was pressed to get to Lostintranslation (which finished second) inside the final 200 yards before driving him out to score by two and a quarter lengths, much to the delight of punters as day two got off to a positive start. ANOTHER classic renewal of the Pertemps saw Abolitionist head to the front from the off, where Sam Twiston-Davies set a searing gallop. That made it a true test and they were well strung out halfway around, with 25 lengths from first to last, but Geraghty was never too far away on eventual winner Sire Du Berlais for Elliott. Abolitionist was still ahead at the top of the hill and there weren't too many left in contention, with the first four home all coming from relatively close to the pace. Rachael Blackmore came strongly on Cuneo (fourth) to lead between the last two but was picked up by Mark Walsh on Not Many Left (third), which held the upper hand until the final 75 yards. Sire Du Berlais chased him down strongly and was game in the closing stages to hold out in the final strides as Debra Hamer's Tobefair came with a wet sail under Tom Bellamy to finish a neck behind in second. FRODON went straight to the front and it was there he would stay for nearly every yard of a vintage renewal of the Ryanair Chase. Charbel was never travelling and clouted plenty of fences before eventually being pulled - as were Sub Lieutenant, The Storyteller and Terrefort - as Bryony Frost blazed a trail in front on Frodon. Rachael Blackmore was always close on Henry de Bromhead's Monalee while regular front runner Un De Sceaux was held up in midfield along with Mullins' stablemate Footpad (7/2 favourite). Eventual third Road To Respect arrived on the scene in the closing stages but a bad mistake at the third last greatly impeded his challenge as Frodon was headed two from home by outsider Aso. It looked like a huge upset was on the cards with Venetia Williams' charge jumping the last in front, but Charlie Deutsch was eventually gunned down by a gutsy Frodon, which rallied in the final 150 yards to get up by a length and a quarter and justify Paul Nicholls' decision to sidestep the Gold Cup. THERE was little comparison with last year's crawl as Nautical Nitwit set off at a frantic pace and made this a proper test of stamina. Sam Spinner was always close to the lead and eventually took over at the head of affairs at the eighth, with the evergreen Faugheen tracking the front pair in third under Walsh, and Kilbricken Storm close by in fourth. Hot favourite Paisley Park (11/8) was well back and hit his customary flat spot after three out and looked in trouble before creeping closer under Aidan Coleman's urgings. It seemed like he had a lot to do but the seven-year-old cruised up from the second last to the final hurdle before a mistake opened the door for Sam Spinner to mount another challenge in the home stretch. Joe Colliver threw the kitchen sink at his mount but Paisley Park simply had too much class as he made it five from five this season by powering up the home straight with the admirable Faugheen fending off stablemate Bapaume to keep third. A MASTERCLASS from Lizzie Kelly saw Siruh Du Lac set an unrelenting gallop from start to finish in a thoroughly likeable performance. King's Odyssey came down at the seventh in front of the stands as Siruh Du Lac continued to jump boldly and stagger out the 22 runners. Nicky Henderson's favourite Janika (3/1) travelled sweetly under Daryl Jacob - despite encountering some problems on the way - before mounting a challenge three out. The winner was very game, however, and while Janika got close, there was no passing Siruh Du Lac. He got close but Kelly's mount continued to find a little bit extra as the finish line approached. There was three quarters of a length between the pair at the finish, with Spiritofthegames back in third for Dan and Harry Skelton while David Pipe's Eamon An Cnoic was just behind in fourth. THE first seven home read odds of 50/1, 66/1, 40/1, 25/1, 33/1, 50/1 and 100/1 in one of the most unpredictable results in Cheltenham Festival history. Power blazed a trail on Emily Moon - eventually pulled up two from home - as Henderson's favourite (15/8) Epatante failed to land a blow and never got involved. Presidente Line threatened to cause a French upset but Mullins maintained his unbeaten record in this race as Eglantine Du Seuil (Noel Fehily) and Concertista (Danny Mullins) fought out a thrilling finale. Concertista edged right on the run-in and was just caught in the shadows of the post by a short head as Fehily notched a victory at his final Festival visit before retirement, while Elliott's Tintangle was back in third with Black Tears in fourth. IT was amateur hour once again with another false start and eventual fourth Crievehill took it up once proceedings got under way. Elliott's Measureofmydreams (3/1 favourite) was never really going smoothly under Jamie Codd and Any Second Now cruised into contention turning in before being unleashed by Derek O'Connor. He shed his maiden tag (0-9 before this) in dominant fashion by asserting late on under a fine ride, with Kilfilum Cross three and three quarter lengths back in second and The Young Master a similar distance back in fourth.